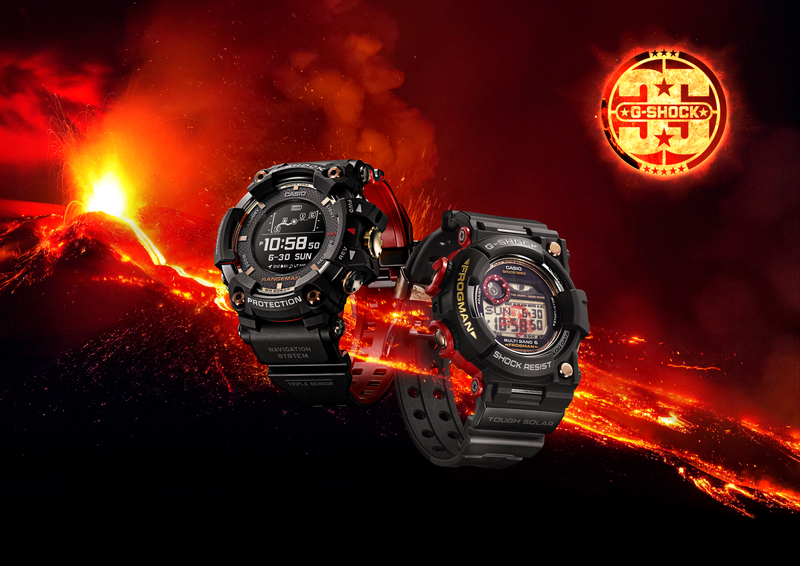 DOVER, NEW JERSEY, Nov. 13, 2018 - Today, Casio G-SHOCK announces the release of the MAGMA OCEAN Collection. The collection, which is the final collection launched in honor of G-SHOCK’s year-long 35th anniversary celebration includes two new RANGEMAN (GPRB100TF)and FROGMAN (GWF1035F) models. An update to G-SHOCK’s highly revered RANGEMAN and FROGMAN timepieces, both feature a case back engraved with the 35th anniversary logo and come in a commemorative black and rose gold package. The collection also honors the 25th anniversary of the original FROGMAN model. The MAGMA OCEAN Collection features G-SHOCK’s symbolic shades of black and red as base colors – highlighted with brilliant rose gold and yellow gold accents to celebrate the 35th anniversary. Just as the colors evoke the memory of the magma ocean that covered the planet during its formation, the collection also nods to G-SHOCK’s heritage while declaring Casio’s commitment to continually create valued G-SHOCK models for years to come. First introduced in 1993, this latest FROGMAN model marks the timepiece’s 25th anniversary with a stylized frog placed throughout. The model also comes equipped with the collection’s advanced diver technology, ISO certified, which includes Tough Solar – providing a high-capacity solar-charging system to withstand long outdoor excursions. The watch is also capable of storing Log Data for up to 10 diving logs, as well as displaying moon data, three levels of tide graphs and multi-band atomic timekeeping. Similarly, the collection’s RANGEMAN model is equipped with G-SHOCK’s toughest technology for the most intense outdoor situations, including a superior, mud-resistant structure and low temperature resistance of -20C/-40F degrees. The watch also comes with premium features such as a scratch resistant, clear sapphire glass, ceramic case back, Bluetooth and GPS Navigation capabilities, Point Memory (up to 60 sets of point data), a Digital Compass, Barometer, Thermometer, and more. The GPRB1000TF-1 will retail for $900, while the GWF103F-1 will retail for $750. Both will be available for purchase beginning this December at selected G-SHOCK retailers including Macy’s, G-SHOCK Soho Store, and gshock.com.